Join us as we celebrate the achievements of outstanding adult learners! 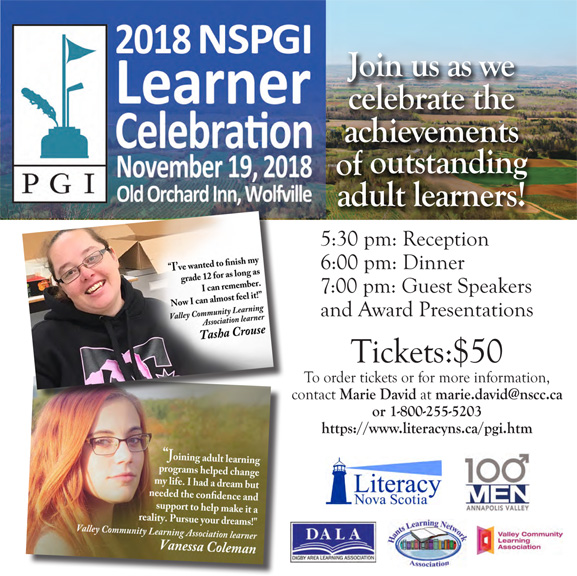 The Peter Gzowski Invitational for Literacy Nova Scotia event includes a reception, dinner, guest speakers, award presentations, and speeches by outstanding adult learners who changed their lives and the lives of those around them by improving their literacy and essential skills. 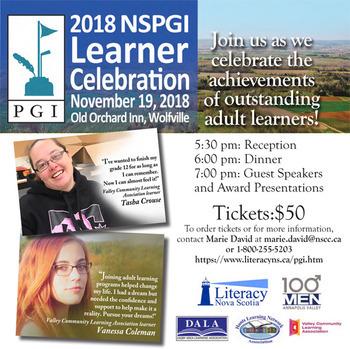 This event is co-hosted by Literacy Nova Scotia (LNS) and their partners Digby Area Learning Association, Hants Learning Network Association, and Valley Community Learning Association, and made possible by a generous donation from 100 Men Who Give A Damn Annapolis Valley. Please order your tickets by November 2nd.